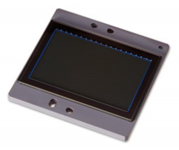 The KAI-16000 is an interline transfer CCD offering 16 million pixels at up to 3 frames per second through 2 outputs. This image sensor is organized into an array of 4,872 (H) x 3,248 (V) with 7.4 micron square pixels and full 35mm optical format. As an interline transfer CCD, the KAI-16000 includes additional features such as progressive scan readout, electronic shutter, low noise, high dynamic range, and blooming suppression. These features make the KAI-16000 the perfect sensor for applications in Industrial, Aerial, Security, and Scientific markets.